Shops, bars, a hotel and up to 40,000 sqm of office space could be built on land next to Sheffield's Meadowhall Shopping Centre. 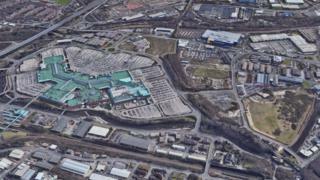 British Land, which co-owns Meadowhall, has been granted outline planning permission to develop 17 hectares (42 acres) of vacant land. The scheme replaces previous plans which included up to 1,300 homes. According to supporting documents the development could support between 3,090 and 4,810 jobs. A council report said if approved the scheme, which also includes plans for a car showroom and gym, "will regenerate a large vacant site and has the potential to deliver a significant number of jobs". It added that while the proposal would "marginally worsen air quality", the benefits "significantly outweigh" the negatives. According to the Local Democracy Reporting Service a number of councillors had raised concerns about pollution, and Green Party Councillor Rob Murphy voted against the scheme. Liberal Democrat Councillor Roger Davison said: "We do need to do something about the air quality in that area as people are already suffering. "It certainly looks a lot nicer down Attercliffe than 50 years ago, and people wouldn't recognise it now, but in those days you could see the smoke - now we have unseen pollution. "We really have to tackle this and I hope we can take measures, not just mitigate it but reduce it." British Land said previously approved plans for a £300m extension of the shopping centre itself were currently "under review".